The 2013 Native American Dollar marked the fifth year of release for the series honoring the contributions made by Indian tribes and individual Native Americans to the development and history of the United States. The circulation strike issues experienced the lowest mintages for the series to date. The reverse design for this year commemorates the Delaware Treaty of 1778, which was the first written treaty between the United States and a Native American tribe. After declaring independence, the United States signed a mutual defense treaty with the Delaware that would allow American troops to pass through the Delaware Tribe’s land to attack the British fort at Detroit, Michigan. The treaty also recognized the Delawares as a sovereign nation and provided the option of joining with other tribes in the Ohio region to form a state. A depiction of a turkey, howling wolf, and turtle are shown on the reverse design of the 2013 Native American Dollar. These animals are all symbols of the clans of the Delaware tribe. A semi-circle of thirteen stars is incorporated to represent the Colonies. Inscriptions read “United States of America”, “$1”, “and “Treaty with the Delawares”. The reverse was designed by Susan Gamble and engraved by Phebe Hemphill. 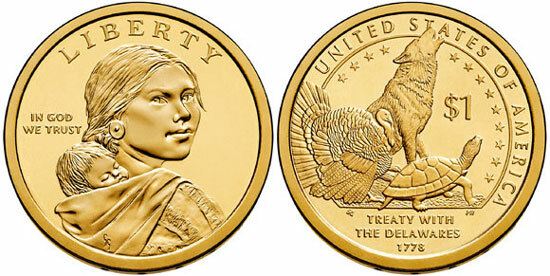 As in prior years, the obverse carried the portrait of Sacagawea and child with inscriptions “Liberty” and “In God We Trust”. Incused edge lettering contained the date, mint mark, and motto “E Pluribus Unum”. On April 22, 2013, the United States Mint offered 25-coin rolls, 100-coin bags, 250-coin boxes, and 500-coin boxes containing circulating quality examples of the coins from either the Philadelphia or Denver facilities. The coins were not released for general circulation, making these products the primary means of distribution. The total mintage for the 2013 Native American Dollar was 1,820,000 pieces at the Philadelphia Mint and 1,820,000 pieces at the Denver Mint. This represented the lowest mintage level for the series and tied the mintage low established for the previous series in 2008.